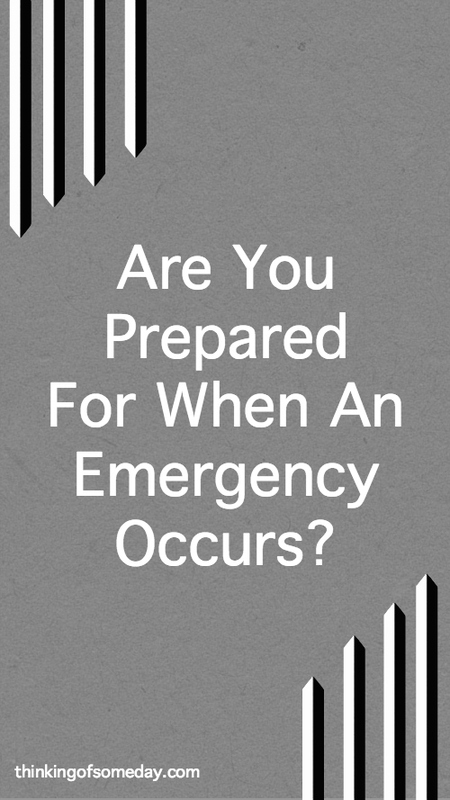 Are you prepared for when an emergency occurs? I’m not talking about if you get a flat tire or have to go to the ER because you had a 24-hour stomach bug. I’m talking more along the lines of if your HVAC system goes out in the winter and it’s 32°F outside? Or if a tree falls on your car and/or house? What about if a natural disaster (or unnatural disaster) occurs and you have to evacuate? However, that’s not always the case. Look at what happened in Houston, especially for the people who weren’t even in a” flood zone.” Or even a little more recently the Tubbs Fire in CA, which sparked this post. I came across a blogging chain on Twitter where several people had written about being prepared for an emergency. I knew it all stemmed from a post that had been shared, but I kept avoiding reading it. Finally, one day I went ahead and read it and I couldn’t believe what I was reading. I don’t want to give away the details because I couldn’t do it any justice anyways, but if you’re interested in reading it, which I highly recommend… You can check it out here. We don’t have much personal experience with natural/unnatural disasters, especially none where we’ve had to evacuate. There was a snow/ice storm when I was younger where we ended up losing power for a week. We were able to go stay with some cousins and even though they didn’t have power either, their fireplace helped to keep us warm. I don’t even recall what we did for food. As an adult, we’ve dealt with snow, but none that was that serious. More recently we had the after effects of Hurricane Irma. We didn’t even realize there was a possibility that we would have bad weather coming our way until relatives out-of-town started asking about it. So we did stock up on some bottled water, snacks, and fruit. We lost power, but we do have a gas stove so we didn’t go hungry. Ultimately we were OK in this situation as well. We’ve also dealt with our HVAC system going out right before Thanksgiving and it was very cold in the house. Before that, when I was pregnant with our son, we dealt with the fear of not knowing whether Omar had a terminal illness because he was very sick and for a while, the doctors didn’t know why. You can read more about that story here if you like. In all cases, we’ve been thankful that we had life insurance and our emergency fund once we were out of debt. Listed below are some things to think about regardless of if the emergency is something that involves your family, home, car, or a natural/unnatural disaster. Do you have an emergency fund yet? If you’re working on getting out of debt you should have $1000 – $2000. However, if you’re already out of debt then you should have 3-6 months worth of expenses. Make sure you have some cash on hand. We’re guilty of this one. We use to make sure that we kept at least $100 of cash at home, but now we haven’t done that in quite some time. Make sure you have it and know your deductibles and your coverage. If you don’t have any, then look into getting some. It’s not about the money (kinda)… It’s about the protection for your family. We prefer term-life over whole-life, which we plan to discuss in a future post. Again, a will isn’t about the money (kinda) it’s about your assets and your final wishes as well as protecting your family. We have slacked in this area as well. We started working on our wills, but haven’t finished them yet. If you’re not prepared for when an emergency occurs in the least bit, then you need to reconsider. Don’t let the invincibility factor sneak up on you and make a bad situation worse! 2: The Retirement Manifesto – Am I A Prepper? 9: John And Jane Doe – Thinking the Worst: Emergency Planning or Fighting the Last War? 11: Money Beagle – How Much Would You Replace If You Lost Everything? 13: She Picks Up Pennies – How Can A Planner Be Unprepared?